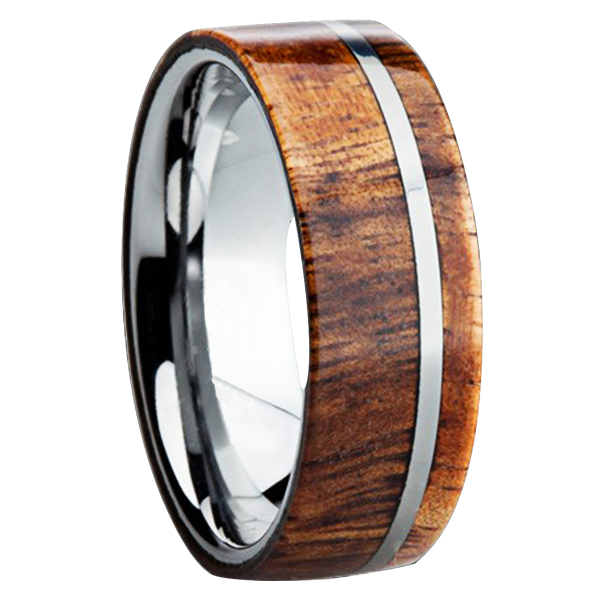 The mensweddingbands.com website recently expanded its Exotic Inlay Collection which will now include Tungsten as well as Titanium wedding bands – inlays include dinosaur bone, meteorite, 50 styles of wood, and antler inlays! St. George, UT — April 7, 2015 — Today Tayloright LLC announced the expansion of its Exotic Inlay Collection on its premier website – www.mensweddingbands.com. Exotic inlay designs are the most popular fashion category on the trio of websites owned by Tayloright LLC. Designs are now available in Tungsten – one of the most durable and scratch-resistant contemporary metals available on the market today. Although wood is still the most popular inlay – featuring over 50 styles of wood including Asian Sindora, Oak, Redwood, Bloodwood, Blackwood, KOA Hawaiian wood, tulip wood, and a wide variety of hardwoods – other inlays include seamless varieties in antler, meteorite, dinosaur bone and Mokume Gane. “We are thrilled that we are now carrying Tungsten – a highly sought after contemporary metal that will add depth to our Titanium Inlay Collection” said Taylor Johnson, founder of Tayloright LLC. “With this addition, we anticipate another significant increase in monthly revenue as customers can now find the widest variety of contemporary metals anywhere including Titanium, Cobalt, Tungsten, Gold, Platinum, Diamond Medleys, and a substantial collection of solid pieces without inlays,” he continued. Prices range from the mid $200’s to thousands of dollars for inlay pieces with high quality, F color diamonds. See one of our most popular models in wood inlay called the K109M is pictured below. For more details please visit www.mensweddingbands.com or call 801-755-1661 Monday – Saturday from 8 am to 8 pm Mountain. Based in St. George, Utah, Tayloright LLC, began operations in March of 2009 selling primarily mens wedding rings and men’s accessories. Currently, Tayloright LLC serves all of the United States, Canada, Australia and certain countries within the international community. Their innovative men’s rings and wedding bands offers one of the internet’s largest selections – including stunning, patented designs for men and women seeking eye-catching, one-of-a-kind pieces many of which include diamond-enhanced varieties. Other sites owned by Tayloright include www.tungstenrings.com and www.mensringstore.com.